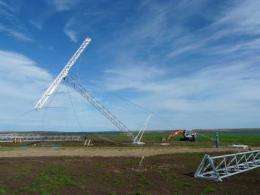 Physicists and engineers at the University of Leicester and the British Antarctic Survey (BAS) have installed a radar system on the Falkland Islands to monitor the upper atmosphere activity which creates the 'Southern Lights'. The University's Radio and Space Plasma Physics Research Group already operates radars in Iceland and Finland which measure activity in the Arctic region. Now, in partnership with BAS, they are able to do the same in the Antarctic. 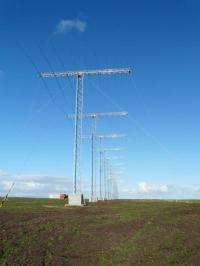 The radar station itself is a group of 16 fifty-foot aerials which can bounce radio signals off charged particles in the ionosphere. The new radar joins a network of 22 such radars, the international Super Dual Auroral Radar Network or SuperDARN. Data from SuperDARN is made available across the internet in real time, monitoring the upper atmosphere to understand its link with the lower atmosphere, where our weather is, and the impact of the Sun's 'solar wind' on our environment. Solar wind particles are carried to Earth where our planet's magnetic field focuses them towards the poles where they collide with atmospheric particles, creating the spectacular light effects of the Northern Lights (aurora borealis) and Southern Lights (aurora australis). "There are several radars already covering parts of Antarctica but the Falklands location is particularly interesting," says Dr Steve Milan. "The magnetic field in that area is relatively weak, a phenomenon called the South Atlantic Anomaly. Also, winds rising over the Andes mountain range affect the upper atmosphere there." 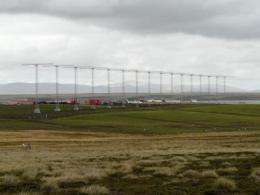 The Falklands radar is funded by the Natural Environment Research Council (NERC). It is a collaboration between the University of Leicester, which supplied the masts, and BAS, which provided the electronic equipment. "The electronics come from a long-established BAS radar station which is currently being moved and rebuilt because it's on an ice shelf which is slipping into the sea," explains Dr Milan. "When the equipment came back to the UK for refurbishment, we realised that we could combine it with a spare set of antennas and temporarily establish a station on the Falklands." "Although the Earth receives most of its energy from sunlight, it's not clear how important the solar wind is for atmospheric dynamics," says Dr Milan. "Climatologists need to be able to factor the influence of the solar wind into their measurements and calculations." More information: More information on the UK's contribution to SuperDARN can be found at www.superdarn.ac.uk .